Kubu Beach is located in Kubu District, West Kotawaringin Regency, Central Kalimantan Province. 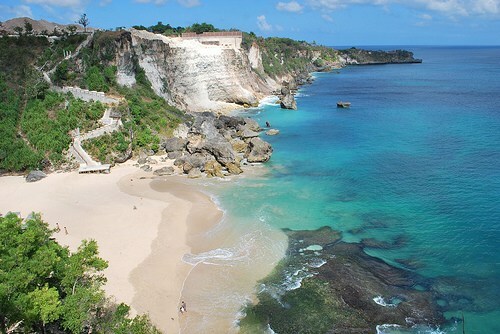 This beach is the fishermen area and facing of Java Ocean. This beach has white-brownish sand beach and becomes one of favorite tourism destinations in Pangkalan Bun. This place also quite good for you who wants to go into seclusion from noisy of the cities. Water on this beach colored brownish caused by peat forest near from the beach. When you are here, you can try banana boat. To enjoy it, you have to entering from entrance gate where there’s a statue. There are two entrance gates: entrance gate shaped as a crab and entrance gate with crocodile statue in front. Both entrance gates have different things inside. On this pier you can feel how cool sea wind breeze is. You can also enjoy the beautiful panorama of the sea. If you walk through the entrance gate where the crocodile statues lies in front of it, you can enjoy some facilities offered. One of them is banana boat. Boat rental is also available here. You can rent it for boating around the beach. You only need to pay 10,000 per person. Another facilities on this beach are quiet complete. There are restaurants offer various seafood menu such as squids, sea shells, crabs, lobster etc; souvenir stands sell Kalimantan’s typical souvenirs.For you who wants to stay longer, there are hotels ready to be rent near by Kubu Beach.